Ultralight worm fishing for trout in streams is extremely effective! So far I have written a number of essays that touch on the Japanese "Zero" fishing approach. Initially, I had thought it was "zero tension", based on the concept that fish would spit out even natural bait if they felt tension on the line. More accurately, Zero Fishing tries to come as close as possible to adding nothing (or "zero") to the natural bait. A "Zero" rod has a very soft tip so the fish does not feel tension when taking the bait. The hook is a relatively small fine wire hook. The tippet is as light as the rod can handle, which for some rods is thinner than Varivas 10X, which is .064mm (.0025") and 1.1# test. The split shot is only as large as absolutely necessary to get the bait to the right depth. It is an entire system (hook, line and sinker - and rod) all working in concert to allow the most natural drift and to not alert the fish even after it has taken the bait. On my July 24 trip, I proved to myself that fish will indeed spit out natural bait if they feel tension on the line. I was fishing a small (15 CFS) stream with a Suntech FMX Keiru extra stiff 5.3m rod and a very short line, essentially dipping a worm into all the eddies and seams that looked like they might hold a trout. The trout were small, wild and numerous. I got lots of hits. I should mention they were also very, very quick. Out of lots of hits, I caught exactly one fish - and even for that one, a moment's inattention allowed some slack in the line (so when it took it felt no tension). When I noticed the slack and tightened the line there was a fish on the other end! For all the other fish, I felt a quick tap and then nothing. The fish reacted much faster than I did. It was a fairly frustrating morning, so in the afternoon I tried the exact opposite approach. Instead of a long stiff rod and a fairly short line, split shot and yarn markers, I switched to a light flexible rod, a size 2.5 level fluorocarbon tenkara line about the length of the rod, 3' of 8X tippet and no split shot. I stumbled on "ultralight worm fishing." I started with my softest rod, a Nissin Seikon Bessaku Tsuzumi 330, which measures all of 6 pennies. The rod is so soft and the casting motion so slow and gradual that it did not tear the worm off the hook. The weight of the line, plus the weight of the worm itself made casts easy and accurate. Basically, I waded up the middle of the stream (too many streamside trees and bushes to do anything else) casting upstream into every likely looking spot. As the worm drifted down towards me, I lifted the rod tip to keep as much of the line as possible off the water. To say the method was successful would be an understatement! I caught lots and lots of fish. This ultralight worm fishing had promise! One of the things I realized was that the slight line sag you get with even a light line when tenkara fishing has the same effect as a very soft rod tip when keiryu fishing. You will see the take but the fish won't feel the tension. With a tenkara line, you can see the line pull forward or to the side, or hesitate, or just twitch, but the sag provides enough slack in the system that a fish can take the hook and not feel tension from the line. That turned out to be the key to ultralight worm fishing. If you are fishing with an artificial fly, the fish will know immediately it isn't real. If you are fishing with a worm or salmon egg or live nymph, though, using a small hook and no weight, it won't know until long after you do. My next question was whether the technique was limited to the softest of rods. Would it be possible to use a firmer rod and still not tear the worm off the hook when starting my forward cast? I switched from the extremely soft Tsuzumi to a Nissin Pocket Mini 360, a 17 penny rod that is much closer to the stiffness of a lot of tenkara rods. I switched the line from a size 2.5 fluorocarbon level line to a 3.6m Fujino White Tenkara line. The Pocket Mini cast the new line very nicely. By slowing my cast just a bit, concentrating on starting the forward cast slowly and accelerating smoothly, I still got great casts and did not rip the worm off the hook. Where the stream opened up a bit I switched to a Suntech GM Suikei Keiryu Special 44 and a size 3 level fluorocarbon line. The result was the same. Concentrating on making a smooth, jerk-free cast allowed me to cast a worm and not have it come off the hook. 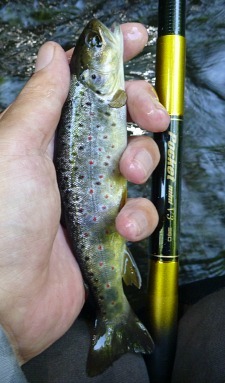 For ultralight worm fishing in small streams, using a seiryu or tenkara rod as opposed to a much longer keiryu rod makes a lot of sense. The tenkara line provides the weight needed for the cast, so a split shot is not necessary. Although I did not try it that day, in retrospect, the rod I carry that would be ideal for this type of fishing is the Nissin Royal Stage Syunki seiryu rod. It is soft enough to cast the size 2.5 line nicely and smooth enough that it will not tear the worm off the hook. 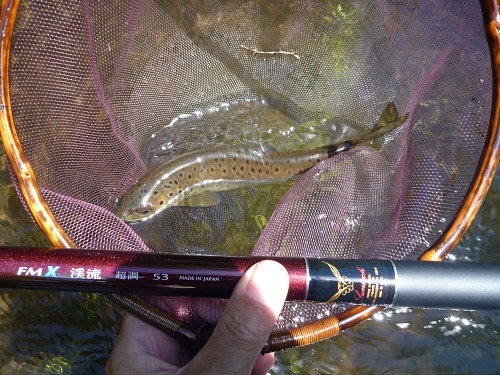 Even for larger streams, if the water is shallow enough that you don't need weight to get deep, a keiryu rod paired with a tenkara line will still give you the same natural drifts and allow you to cover more of the stream. One thing gradually became obvious as the afternoon progressed. I wasn't getting snagged on the bottom. That is one of the biggest problems I have found while keiryu fishing in small streams. The depth is so variable that when keiryu fishing I kept getting the split shot stuck between rocks on the bottom. With ultralight worm fishing - no split shot - I got almost no snags. The unweighted worm seemed to go over and around rocks along with the current - which is just what a worm with no hook or line attached would do! Ultralight worm fishing, using a rod light enough to cast a very light tenkara line and a worm with no additional weight is as close to a perfectly natural drift - as close to "zero" - as you are likely to get. 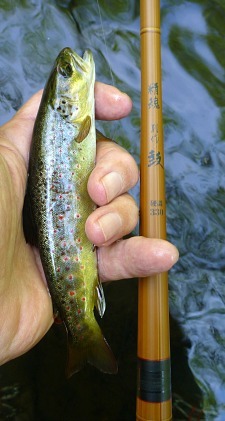 For anyone who might be interested in keiryu fishing, but would like to try it before going out and buying a new rod, you can definitely try ultralight worm fishing with a tenkara rod on a small to medium stream. Use a softer rod, concentrate on a smooth cast, and use worms rather than salmon eggs. They stay on the hook much better. Do not use night crawlers. They are much too large and there is too great a chance that the fish will bite a part of the crawler that doesn't have a hook in it. You can't wait to make sure it has the hook because then the hook will be down its throat. Even the red worms or "trout worms" you can buy are likely to be too large and should be broken in half. I use red wigglers. The largest ones are less than 2" long and most are about an inch and a half. Meal worms or wax worms would be the right size, but they don't stay on the hook nearly as well as red wigglers. Use light line, very light tippet, and small light wire hooks. If the stream is shallow enough use no split shot at all. If it is a bit deeper, one or two size 10 shot should do it. I have found the two #10 shot is sufficient for knee deep water. If the current is knee deep and fast, though, it is not the right spot for ultralight worm fishing. Back in the day, before the movie "A River Runs Through It" made worm fishermen look like fools, it was not uncommon to hear of people fishing a worm with a fly rod. 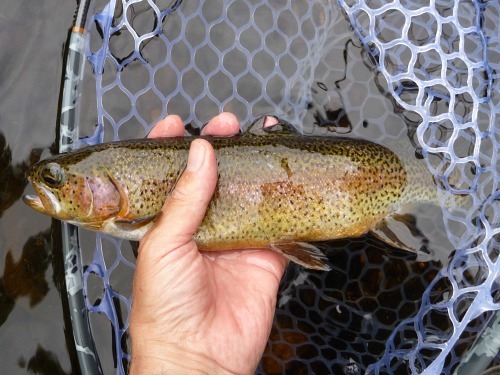 However, the same advantage tenkara fishing has over fly fishing - the ability to keep the line off the water's surface - applies to ultralight worm fishing with a tenkara or seiryu rod rather than a fly rod. For short casts in small streams, the longer rod and lighter line are just more effective in producing a natural drift. When WC Stewart wrote about fly fishing and worm fishing almost 160 years ago, he stated that a worm rod should be "at least four feet longer than that used for fly." What is popular in fishing rods changes over time, but the laws of physics don't. Long rods give you better drifts than short rods, and better drifts catch more fish. Given how internet search engines work, I suspect spin fishermen looking for information on worm fishing for trout in streams might find this page. 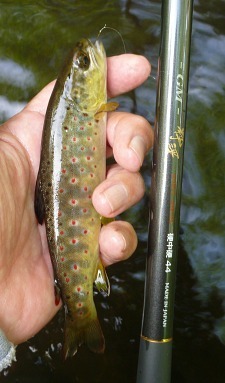 You can use much of the information presented here even if you don't have a tenkara or keiryu rod. I recently read a comment on a fly fishing forum that described how a guy with an ultralight spinning rod did very well by casting a worm (with no split shot) upstream and kept the line tight by reeling in as the worm drifted down to him. The guy who wrote the post (a fellow tenkara angler) talked to the spin fisherman and was told he watched for the flash of the fish as an indication of a take. If the light is right you will be able to see some of the takes, but I'd have to say of all the fish I caught that day, I only saw one take the worm. What I saw was the line move. Rather than relying on seeing the flash of a fish going for the worm, I would suggest using a hi vis line. Stren makes their Crappie Mono line in a High-Vis gold. I'd use the 2# test, but even that is much thicker than the tippet I was using, so I would still suggest using maybe a foot of 8X tippet, which is almost as strong but is just over half the diameter. The thinner tippet will allow a more natural drift. The biggest problem I see in adapting ultralight worm fishing for spin fishermen is that most ultra light spinning rods are also very short. This is definitely a situation where a longer rod is better. Even with 2# test line, you'll want to keep as much line as possible off the water. Less line in the water means a more natural drift. Also, casting a worm with no split shot, or just a size 10 shot, is much easier if you have a longer rod. One thing tenkara fishing has proven to me is you don't have to make long casts to catch fish. If you aren't making long casts you don't have to use a lot of weight. 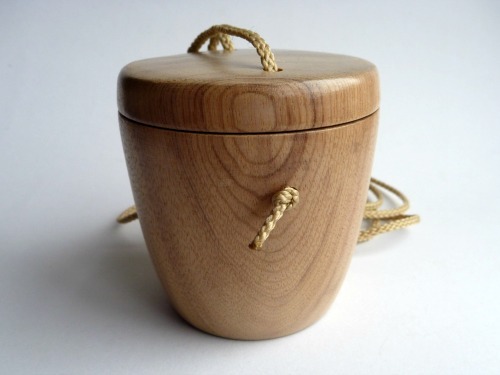 If you don't use a lot of weight you are much less likely to get snagged on the bottom. Ultralight worm fishing works! I see spin fishermen on the streams where I fish, but I have only seen one who was wading. That surprises me. 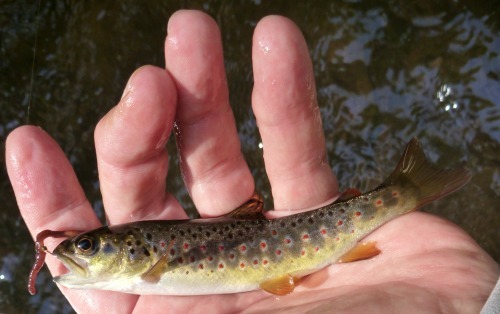 Lots of the prime holding lies for trout are easy to reach if you wade and virtually impossible to reach if you don't. Truly, trout are not just in the pools - which are the only places I see spin fishermen. The spin fisherman I read about that did so well casting unweighted worms upstream? He was wading! Get a pair of waders - or just hip boots for small streams - and get out to where the fish are! Try wading and fishing upstream with no weight, letting the worm drift naturally and keeping the line as tight as you can without pulling the worm faster than the current. I'm confident you'll catch fish, many more than you'd catch chucking a heavy split shot into a pool and sitting there waiting for a fish to find your worm. I'm hopeful you'll get intrigued by the effectiveness of fishing with a light line and no weight, and will want to try one of the long Japanese keiryu (bait fishing) or tenkara (fly fishing) rods. They bring a whole new meaning to ultralight fishing in general, and ultralight worm fishing in particular. Plus, of course, if you've ever thought about taking up fly fishing, ultralight worm fishing with a tenkara rod is an easy first step. I have recently started importing Japanese ultralight spinning gear, which is offered on my other website Finesse-Fishing.com. The very soft ultralight spinning rods designed for "areas" (managed, stocked trout ponds) would be well suited for ultralight worm fishing with a spinning rod. The Daiwa Iprimi rods in particular would work nicely, especially when paired with an Iprimi 1003 reel and Troutist Area Meister 2# test line. The line is hi-vis orange with a built in translucent smoke grey "tippet" so you can see the line for bite detection but it won't scare the fish. For a few months now, I have heard about the Japanese Ajing and Mebaru rods, which are ultralight rods for relatively small salt water fish. I'd heard that the Ajing rods were excellent for sunfish, and that the Mebaru rods, which have slower actions, were excellent for both sunfish and crappies. I finally got a chance to fish with a Mebaru rod, and it would be an excellent choice for ultralight worm fishing! The advantage they have over the Area rods like the Iprimi is that they are longer, making it possible to hold more line off the surface. They are also a bit firmer in the midsection, so they would likely give a bit more control over a good sized trout in current. That ultralight worm fishing is a blast and you never leave without many fish caught. Thanks again.